As with all grant applications to the Urban Areas Security Initiative, the project must have a nexus to terrorism. In its proposal for a Homeland Security Grant, the Solano County Sheriff writes, “We will be able to…locate persons and vehicles associated with terrorist threats, disrupt terrorist financing…” However, given that terrorism is extremely rare, this surveillance network is more likely to be used against pedestrian suspected criminal activity. The PowerPoint document states, “There are 36 (666) locations, many of which are large freeways and near impossible to watch at once.” “666” is a police code for a county-wide emergency or be-on-the-lookout (BOLO). However, the grant application and approval documents cite 35 locations. 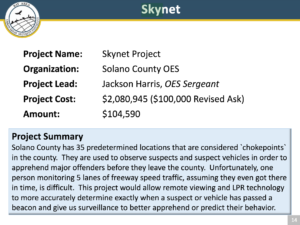 On July 13, 2017, the Bay Area Urban Areas Security Initiative (UASI) Approval Authority approved funding of $104,590 towards the $2 million total cost of Project Skynet. The estimated $2 million cost for Project Skynet is broken down into phases with an estimated cost of $535,000 for Phase I, $568,000 for Phase II, and $895,000 for Phase III. 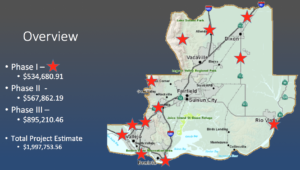 Data from the ALPRs would be stored at the Northern California Regional Intelligence Center (NCRIC), the local joint fusion center that shares license plate reader data with dozens of local, state, and federal agencies. The NCRIC stores license plate reader data for dozens of local law enforcement agencies and as of April 2015, stored 46.5 million records, which includes license plates and photographs of vehicles, including the occupants and surrounding area with geolocation data. Really awesome we’re spending money on big brother projects instead of..I don’t know, helping the poor or fixing roads.